Sunday was a beautiful day to get out, take a walk and explore Downtown Los Angeles. This is what a Flaneur does after all. You may ask, "what is a Flaneur?" Well, a Flaneur is simply someone who strolls or to be more eloquent, saunters. I myself personally sashay. The term Flaneur first came into existence in 19th century France and refers more specifically to a person who takes in the city through casually, nonchalantly walking around and exploring his (or her) urban environment. Well, yesterday I was a Flaneur in spirit, not so much in style. A girl has to be comfortable after all. I wore this bunny sweater/sweatshirt from Urban Outfitters, some ballet flats and my J. Crew little Edie for just the essentials. 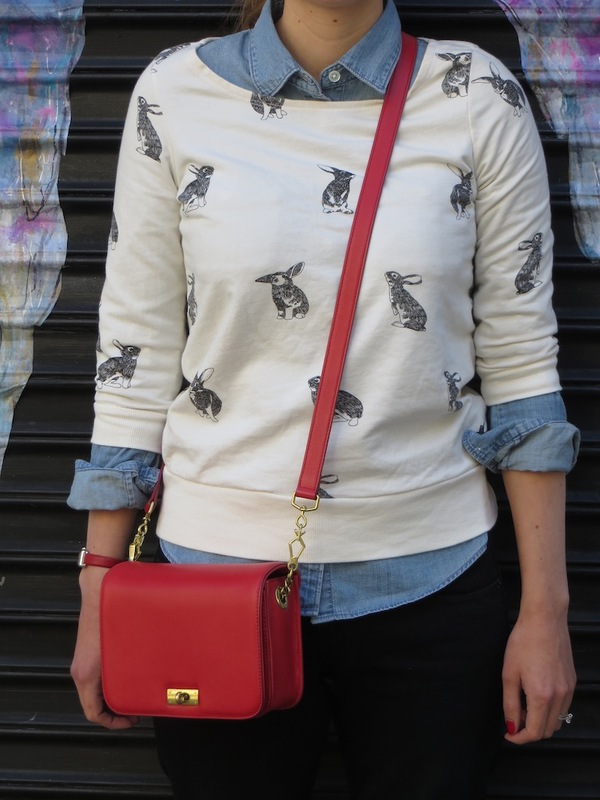 Here I am on Main Street next to a graffitied depiction of a pair of wings. Can Flaneurs fly too? My husband spent about 5 minutes telling me to move to the left or to the right so I'd be centered. LA is a gorgeous city if you look up and spend some time gazing at the buildings which surround you. For just a second you might be transported back in time. This entry is partially inspired by Moby's Architectural blog. You can visit his blog, as it is listed on my "blog roll" to the right. He likes to photograph buildings around LA and Hollywood, primarily in black and white, while sharing random musings on his findings. I contemplated doing the black and white route with these photos (it's more academic and more pretentious) but decided against it due to my immense love of colors. Here is one such picture which would have lost some of its charm if done in black and white. It is of the Hotel Rosslyn on the corner of 5th and Main Street. Most of our jaunt downtown was spent on Broadway. We actually went on a tour through LAVA an association which promises and delivers with their quest to bring one "compelling experiences" with the city of LA. Many of their tours and events are free, so if you are in LA you should check them out, as their passion and love for the preservation of this city are truly inspiring. 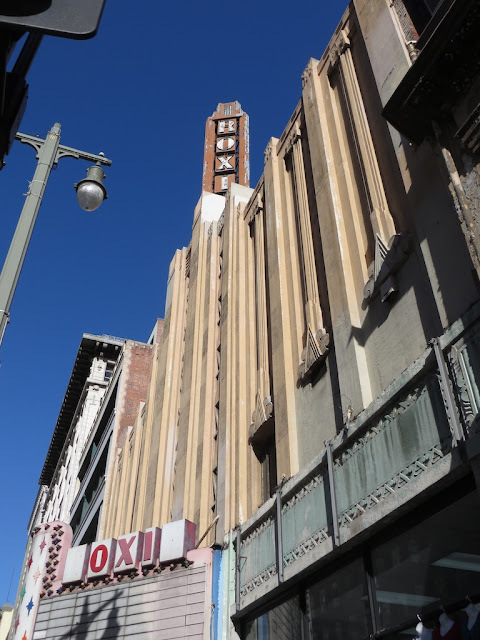 On this tour our very knowledgeable guide went through some of the history of buildings situated on Broadway, most notably the theaters which represent a small glimpse into the once thriving, colorful and perhaps enigmatic past of downtown LA. Below you will see some of my photography of the buildings of Broadway. 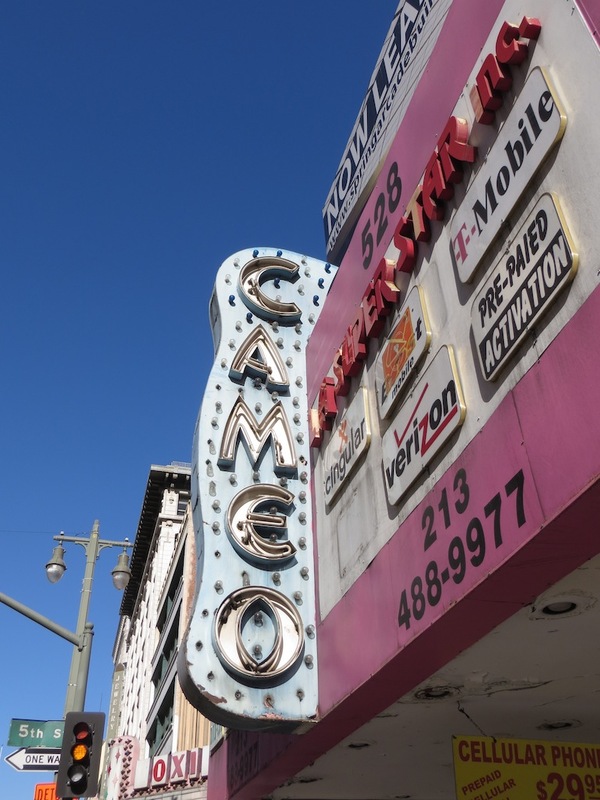 I decided to focus on the marquis of various theaters, for the most part now vacant, including the Los Angeles, Palace, Cameo, and Roxie. The diversity of these structures is pretty cool (and reminiscent of Tod Hackett's discovery of the mishmash of architectural forms in Hollywood from The Day of the Locust). 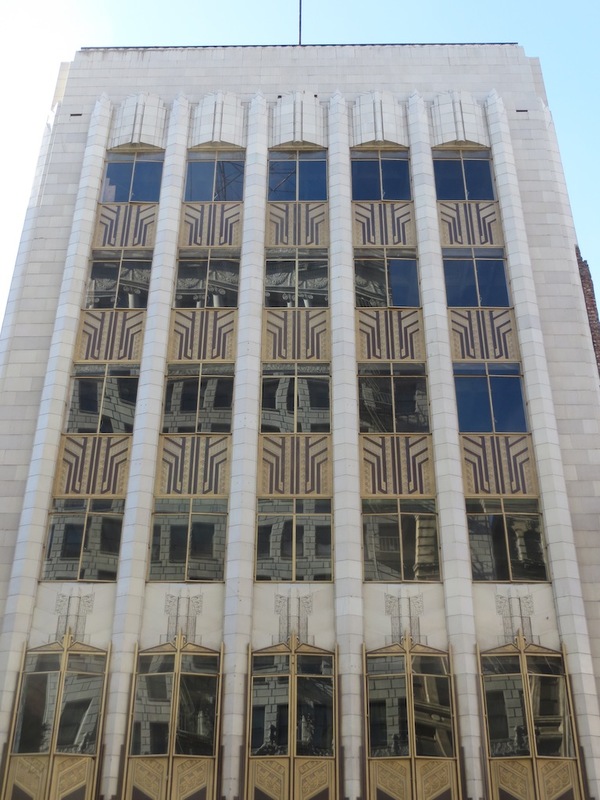 From Art Deco to Beaux Art, to Renaissance revival, it's all on Broadway. 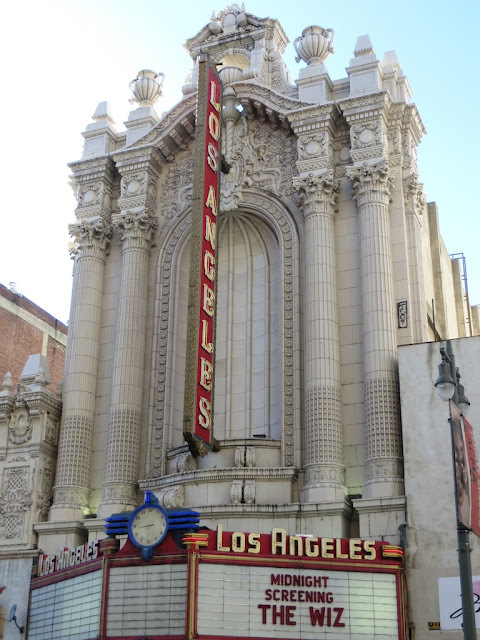 Wouldn't it be nice if we fixed up these once opulent theaters to their former glory? I took many, many photos of Broadway. I am including just a few more which I find to be interesting, even though they are all pretty interesting. Below you see the details of the Palace theater, an art deco styled building which was a former department store, and a building whose name alludes me at the time. 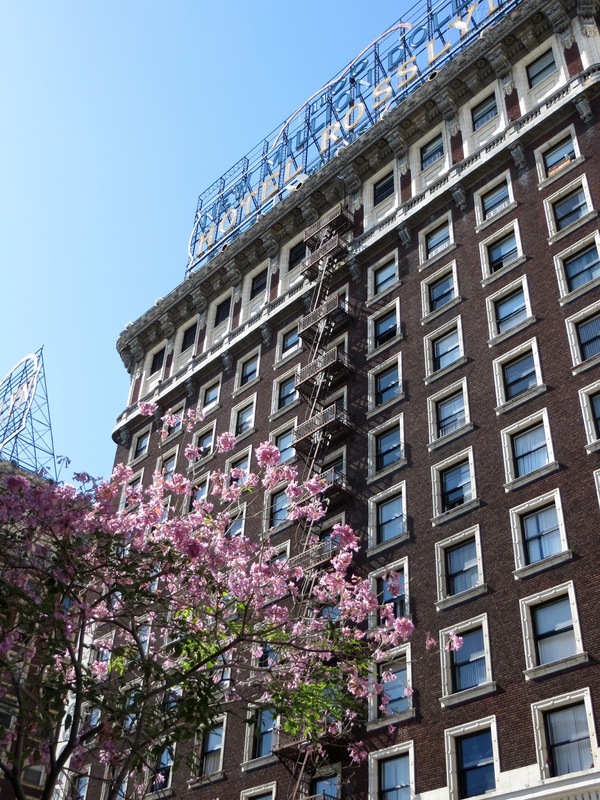 such great photos - our flowers are starting to bloom here in sf, too! and that top is just too cute! Thanks! Sounds like it is turning into spring by you too! The shoes are from J. Crew. They are about two years old I think. This pair is my absolute favorite in terms of comfort. I have this style in both black and olive. Thanks for noticing the details!